Formulated from a two-component, high solid Zinc Rich Epoxy Primer (Part A Part B). Confirms to composition and performance and requirements of Steel Structure Painting Council (S.S.P.C) paint 20 Standard. 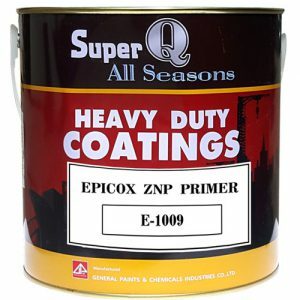 A long-term primer on steel for Epoxy, Acrylic and Polyurethane coating systems in medium to severely corrosive environment. High abrasion resistance to solvents, chemical & atmospheric conditions. It cure to hard wearing and highly weather resistant coating. Excellent mechanical film properties such as Film Hardness, Adhesion and Scratch resistance. Easy application. Can be applied by brush, roller and spray. Excellent chemical & weathering resistance. It provides a tough flexible coating with long term protection and moisture barrier action for steel structures . As a corrosion resistant primer for use with wide range of paint systems. Store in cool & dry place, isolate from source of heat. Up to 18 months in a tightly sealed container. It contains volatile and flammable solvents, ensure adequate ventilation during use and avoid using near fire. Keep in cool and dry places. Avoid breathing vapor. The above information given is intended to give a description of the product performance under specific test conditions. Nevertheless, we cannot assume any responsibility for the use of it since circumstances under which the products are applied in practice are subjected to many variations. We serve the right to alter the given data without notice. Thinner should be added after thoroughly mixing the components. Mix thoroughly, keeps for 30 minutes before use. Dust, oil or grease must be removed perfectly. Oil and Grease: Clean by organic solvent or thinner. Corrosion dust & rust: Removed by sand paper, hand brush or sand spraying. Old paint coating must be perfectly removed, then clean by sand paper, hand brush or sand spraying. After preparation of metal surface, the primer should be apply immediately to avoid re-corrosion. The paint should be thoroughly stirred to a homogeneous consistency before use. All equipment should be cleaned immediately with Thinner after use.